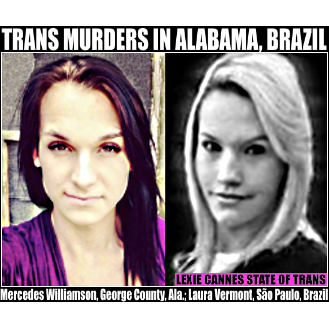 LEXIE CANNES STATE OF TRANS — DNA confirmed that a body buried in George County, Alabama Mississippi was that of Alabaman trans woman Mercedes Williamson. She was reportedly buried on May 30, 2015 following a fatal stabbing. A suspect, Josh Brandon Vallum, was arrested after admitting committing the murder to his father who then turned him in. Hate crime charges are being considered. Vallum was reportedly known to the victim. An investigation into a murder of a transgender teen from Alabama began when the suspect, a convicted felon and longtime member of the Latin Kings street gang, told his father he’d killed someone, police reports show. Josh Brandon Vallum, 28, made the admission on June 1, telling his father, Bobby James Vallum, that the person he allegedly killed could be found in a field behind his dad’s house in the sparsely populated community of Rocky Creek, a report said. By 8 a.m. the morning of June 2, four George County sheriff’s deputies and Vallum’s father started canvassing the father’s heavily-wooded property on Odom Road, looking under brush and debris for a makeshift grave and a body. Within an hour, George County Deputy Sgt. Larry Havard had unearthed a partially-decomposed body hidden under some debris on the property. The victim’s family provided a DNA sample, which the state Crime Lab used to confirm the identity of the victim as Michael Christopher Wilkins, 17, whose chosen name was Mercedes Williamson. The Sun Herald traveled to Alabama earlier this week and spoke to several people who new Wilkins as Mercedes Williamson, a tall, slender, 17-year-old teen with hair well below her shoulders. Her friends say she lived in Gulf Shores before moving to Theodore, Ala. in recent years. Mercedes, they say, was a vibrant young teen who enjoyed the outdoors, riding around with friends in a car or going to a nearby river to swim. At the time of her death, Mercedes was living with Jeanie Miller, 41, in a one-bedroom camper they rented for $50 a week off Greer Road in Theodore. Mercedes slept on a couch in the front of the camper, and Miller slept in a bedroom in the back. Miller said she thought of Mercedes like a daughter and loved her as such. “I was overprotective because she was closer to me than my own daughter,” she said. “She always said ‘I have two moms, two Momma Jeanie’s.’ She wanted to be cosmetologist one day.” Mercedes’ mother, Jeannie Garner, could not be reached for comment. Since her death, a Facebook page, dubbed RIP Mercedes Williamson, was started for those who knew and loved her. Mercedes, Miller said, told her she realized she was different by the second grade. Mercedes moved in with Miller in September. Miller last saw Mercedes around 2 p.m. on May 30, she said, when Mercedes left their home. She said Mercedes had told her she planned to “go over the Bay,” to Gulf Shores. “The last thing she said to me was ‘Love ya later,’ she said, something Mercedes always said when she left to head out somewhere. When Mercedes didn’t return home for several days, Miller said she got worried and called a girl she thought had picked up Mercedes the day she left. That’s when, she said, the friend told her Mercedes was dead. Miller said she later learned that another person had picked Mercedes up that day. Miller’s son, a minor, told the Sun Herald he saw her leaving in what appeared to be silver car. “We never saw her again,” Miller said. Shortly after the remains were found, Miller learned Vallum had been charged in her killing. Vallum, she said, knew Mercedes as transgender long before her death. She said she knew Vallum to stay around the Theodore area, though authorities listed his home address at his father’s home in George County. According to law enforcement reports obtained by the Sun Herald, Vallum was a self-professed member of the Latin King street gang, which originated in Chicago and has since had members in states around the country, including in Mississippi. In the March 2015 police report, a Gautier police officer wrote that Vallum said he had been a member of the Latin Kings for eight years, long before he went to prison on a felony conviction of false reporting of a crime. According to officials at the Mississippi Department of Corrections, Vallum was sentenced on July 7, 2011, to serve eight years on a felony conviction of false reporting of a crime in George County. He was paroled on May 19, 2014, MDOC officials said, but his parole has now been revoked as a result of the murder charge. Meanwhile, Miller wants answers from Vallum. In São Paulo, Brazil, two military police officers were arrested for their involvement in the death of trans woman Laura Vermont. The victim died on June 20, 2015 at a hospital after being injured by means not yet clear. Officers Ailton de Jesus, and Diego Clemente Mendes faces charges of perjury and procedural fraud and are being held in prison. Local police say more about the case cannot be disclosed because the investigation is continuing. I am not able to state for sure if the officers’ neglect caused the death or if they contributed to it. It does appear that Vermont was not in police custody when she was initially injured.